After creating simple LEGO builds as a child in the 1960s, I set aside my love for bricks for nearly 20 years. I then bought LEGO for my daughter, but still didn't heed the call to do any more than build houses and vehicles. Fast forward another 25 years - now, my grandson inspired me to do more with the growing number of bricks in the house - awakening a dormant need to express myself artistically. Not with oils, nor watercolors, nor glue, nor sketchpads, nor colored pencils, nor canvas - no. Beginning with simple LEGO such as 2x4, 2x3, 2x2, and 1x2, I began creating LEGO murals that grew ever larger, colorful, and more challenging. The short video on this page begins by showing a work in progress, and continues with a short tour of my workspace and organizational method. I have always loved the creative - music, art, writing, building, software, sculpture. I've written and recorded songs, written articles and short stories, written millions of lines of computer code. I've also sketched some things, which were pretty good I thought, but in comparison to playing music or writing stories, I found I didn't enjoy the process. I realized that creative expression is probably going to be the most satisfying if you enjoy the process, the journey, and the ongoing refinement of a thought out methodology. Since creative expression takes many forms (I've just listed a few), it makes sense to focus your passion and energy on the one (or a handful) that really offer a complete experience. Here's a little more food for thought. All the images in the public and private posts are hi-res to the point where they are literally a plan, or road map for anyone to create the same image with their own bricks! You can use the same colors, different colors, whatever you like, but the key here is that 95% of the murals are 2 studs deep, and so with enough 1x2, 2x2, 2x4 and 2x6 bricks you can recreate any of the murals. Finally, it's my conviction that perhaps you shouldn't support a LEGO artist (or any artist who uses his hands to create their art) because you think it's a good idea. Do it because you think it's a crazy idea! Do it because it's a ludicrously fun, spontaneously insane idea, and do it because the looks people will give you when you tell them who you support (and why) will be priceless! Just want to help out? Even the smallest donation is beneficial to an artist, so a Bronze Medal patron provides an invaluable sense of support, camaraderie and valued karma. It truly makes a difference. 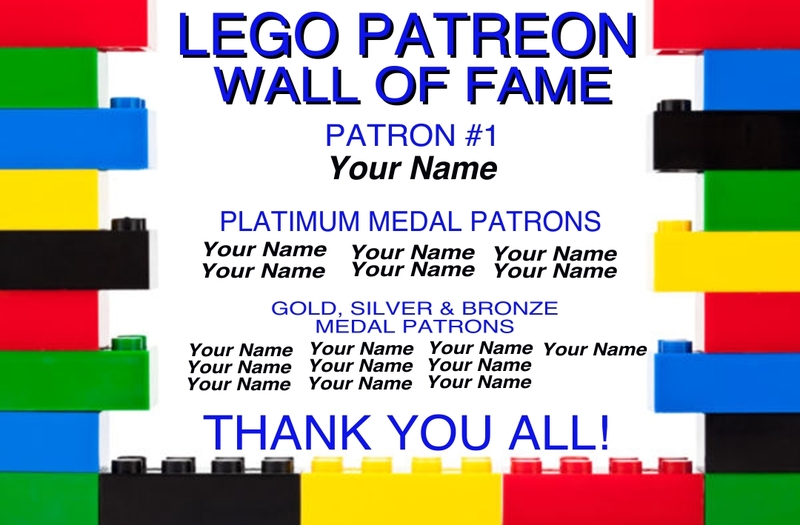 Your name will also be added to our LEGO Patreon Wall of Fame, as seen in the "About" section. A $9 Silver Medal Patron receives access to additional posts, including Behind-the-Scenes content, as well as the occasional poll where I am deciding between three or four subjects for the next piece and I would love to have patrons weigh in. Thank you for considering supporting artists at this level - it is truly appreciated. A $30 Gold Medal Patron retains a once-per-year option (any time after month 9 of your patronage) of nominating a subject, photo or other media for a LEGO mural I will build in my studio. The subject can be you, your family, your children, your car, a piece of art, your house, your favorite athlete, you favorite team logo, your favorite band, your favorite actor/actress, your favorite movie - your choice will inspire me. Let's keep your idea PG-13 and down! I will build out the subject using LEGO bricks from my LEGO Inventory with a maximum length or width between 2 to 2.5 feet (representing about 12-15 man hours of work). I will photograph the mural and post the image here and on Instagram, giving you recognition as the direct sponsor for that piece. The piece will then be disassembled as respectfully as I dismantle the works I make of my own family, favorite sports teams, animals and musicians. My LEGO inventory is infinitely recyclable, and only needs to be fed and grown to the extent that allows for future development and builds of larger and larger pieces. A $90 Platinum Medal Patron retains a once-per-year option (any time after month 9 of your patronage) of nominating a subject, photo or other media for a LEGO mural I will build in my studio, but contrasted with the Gold Medal patron, the subject will be built out using LEGO bricks from my LEGO Inventory with a maximum length or width between 2.5 and 3.5 feet (representing about 20-30 man hours of work). A mural this size is so large it can generally only be built out and photographed on a perfectly flat wood floor. The size allows for a much greater level of detail, requires more forethought and planning, but ultimately, will be a lot of fun to complete. Immortalize yourself, your pet, your house or garden, or your favorite person or persons with a massive LEGO mural. Upon completion, I will photograph the mural and post the image here and on Instagram, giving you recognition as the direct sponsor for that piece. The piece will then be disassembled as respectfully as I dismantle the works I make of my own family, favorite sports teams, animals and musicians. They say you never forget your first Patron, and I know I won't. The first Patron must be thanked in a public post. Will it be you?